A recent comment by a senior official from China’s highest court has riled up Chinese citizens. 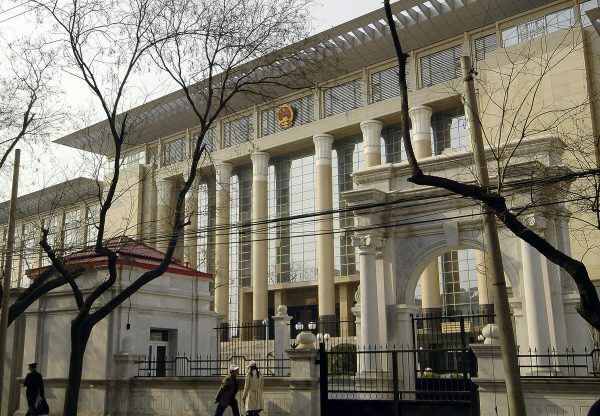 The comment soon drew the ire of petitioners, lawyers, and human rights activists alike, who attested to the lack of rule of law within China’s judicial system. Li Jianfeng, a former judge in Ningde City, Fujian Province, said the system is inherently unjust, as the Chinese Communist Party (CCP) controls the country’s judicial and security apparatuses via the Central Political and Legal Affairs Commission. Because the courts must obey orders from the Party, any entity that the Party dislikes is bound to be unfairly prosecuted, he said. Rights lawyer Zhu Shengwu from Shandong Province told The Epoch Times in an interview that miscarriage of justice is widespread when it comes to different faith groups that are persecuted in China, including house Christians, Uyghur Muslims, and Falun Gong practitioners. The spiritual meditation discipline Falun Gong, also called Falun Dafa, has been persecuted by the Chinese regime since 1999. Under the persecution, scores of practitioners have been arrested, detained, sentenced, and tortured for their faith, despite the fact that the Chinese constitution guarantees freedom of religion. An extralegal state police department, called the 610 Office, was established for the sole purpose of carrying out the persecution. “Based on the number of people, the persecution of Falun Gong is the most excessive, the most severe,” Zhu said. He once represented a Falun Gong practitioner in Yunnan Province who had her home ransacked by police. When the police found other practitioners doing the meditation exercises at her home, they charged her with the crime of “convening a gathering,” according to Zhu. “Our [legal] viewpoint is clear: Practicing faith is not a crime,” he said. According to the World Organization to Investigate the Persecution of Falun Gong, in 2017 alone, 974 Falun Gong practitioners were sentenced to prison. Just during the Lunar New Year holidays in February, 35 practitioners were sentenced and another 30 received court hearings, according to Minghui.org, a U.S.-based website that serves as a clearinghouse for information about Falun Gong in China. Since 1999, a confirmed 4,195 practitioners have died due to the persecution. The real number is believed to be much higher, due to the difficulty of getting information out of China. Since 2015, Falun Gong practitioners have taken advantage of a new set of guidelines from the Supreme People’s Court that allow them to file criminal complaints with the court and the Supreme People’s Procuratorate—the country’s highest prosecutor office—directly naming former CCP leader Jiang as the party responsible for any persecution they suffered. More than 200,000 such complaints have been filed, according to Minghui.org, but no cases have been investigated. A number of lawyers who have represented Falun Gong practitioners and political dissidents have since been imprisoned, such as Gao Zhisheng, an outspoken critic of the CCP leadership, and Yu Wensheng, a prominent rights lawyer. The Epoch Times tried to reach several Chinese lawyers, who said they were given warnings from Chinese authorities forbidding them from accepting media interviews. Others said authorities had given them hush money to stay silent. Petitioners who appeal to central authorities with their grievances also cried foul. Since China’s rubber-stamp legislature assembled on March 5 for a two-week session, scores of petitioners have arrived in Beijing to file their complaints with the State Bureau for Letters and Visits, only to be taken away by police. Many of them appeal in Beijing as a last-ditch effort to seek redress in legal affairs. 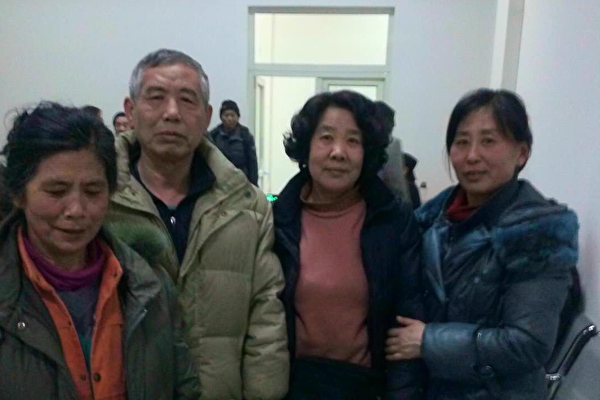 Petitioner Li Ning, for example, from Longkou City, Shandong Province, is seeking justice for her mother’s death. “Since she was killed, I did not get to attend one single court hearing. My family’s rights have been completely taken away,” she said in an interview with The Epoch Times. Chinese scholar Yu Jianrong once conducted a survey of more than 2,000 petitioners. Of them, only three had resolved their grievances through the petition system. 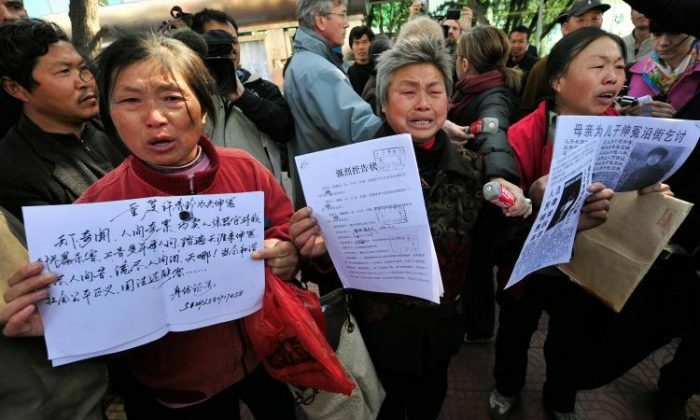 More than 60 percent of them had been detained by Chinese authorities because of their petitioning. Because of the large number of petitioners who get arrested and detained at black jails, the League of Chinese Victims was established in Hong Kong in December 2008 to help secure petitioners’ rights. Within three months, 80,000 people had registered to become members. Other activists, such as Huang Qi, founder of human rights website 64 Tian Wang, was recently sentenced to 12 to 15 years. He is currently detained in Sichuan Province and has been tortured by prison guards, according to a report by Radio France Internationale. Li Xin’an and Xiao Lusheng contributed to this report.